When thinking about what I wanted to write today, I began to think, about how the smallest acts of selflessness and kindness can begin to push someone in a direction that forever changes their lives. When I think on all the directions my life has taken, and the many little details that have come together to lead me here, and how so many are because of other people who have encouraged me, it blows my mind. Sometimes a person changes everything. Lori Anderson is just that kind of person. See this girl below? I just love her. You'd think we have been best friends forever or something. However, we just met in person for the first time the weekend this picture was taken- this past august. I met her through Lori Andersons Bead Soup Blog Party. But let me scroll back just a little bit. I was new on the scene to this whole online thing a few years ago or more. Trying to sell my wares on etsy, joined facebook, got me a blog, and started reading blogs on beading and such. The only thing I was sure of, was that I was totally unsure of what I was doing. When I found Pretty Things, by Lori, her blog spoke to me. SHE spoke to me. Every post felt like it was written for me. Every post was encouraging, helping newbies like me to start a blog, to sell online, to do a show or to submit to magazines. AND she did book reviews, and had great taste may I add. Needless to say, I felt like we "clicked". Because that stuff she was sharing was what I needed to hear. 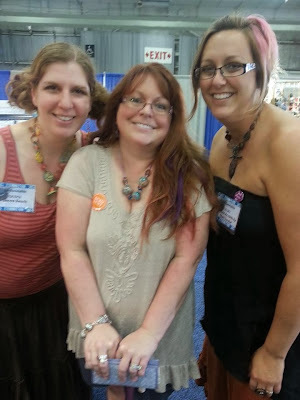 When she had the bead soup blog party, I signed right up. I had just started making bronze beads, and couldn't wait to show them off. She paired me with the great Lynda Mosely of Diva Designs, a wonderful polymer clay artist. I was such a silver and gemstone snob at the time, I must admit, I was not sure what to expect from "plastic" polymer beads. I think I could only remember back to my days in college playing with polymer, and the bright caned hippie beads I made. Silly me. Lynda is a rock star. I got faux gemstone beads from her, and a transfer bead with a shell on it because of my love of sea glass (along with a goodie package that would make any jewelry gal drool!) She got me thinking about polymer in a whole new light. The beads were just amazing. So I started to play around and make beads in polymer clay along with the ones I was already making in bronze and copper. By the time the next Bead Soup Blog party came around, I was making and selling polymer along with my other beads. As I was hopping throught he participants, I saw some lampwork beads, that were chunky and fun and had an organic flow I couldn't begin to forget. I have never been a fan of lampwork either. I mean, I had respect for it, but shiny is just not me. Oh well, another wall that came down for me. I had spyed some awesome stuff from Genea Beads. Genea and I contacted each other (I think she contact me and said she loved my beads, and then I realized it was the person who made the beads I myself had drooled over). Long story short, we traded beads, and became friends. 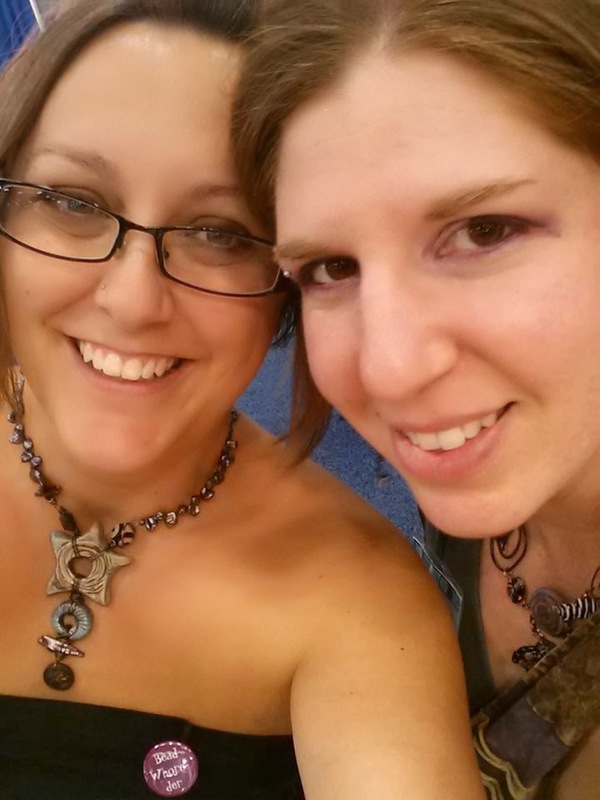 Friends that ended up sharing a booth at Bead Fest years later. Friends that have taken on projects together, who support each other, and laugh with each other. 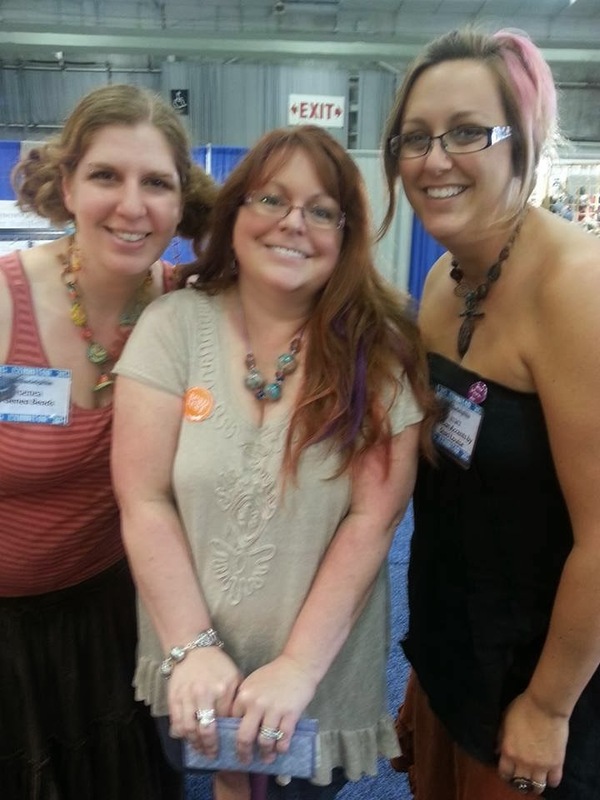 So this year, as I met Genea for the first time, and we did our first huge bead show together, guess who showed up? Lori did. How amazing is that? It meant so much to Genea and I to meet Lori. It was like something coming full circle. One person, just doing what she does best, and she changed my life for the better. How's that for awesome? I know I have mentioned before how much Lori has meant to me, because she was part of leading me to where I am right now. However, I wasn't sure she'd REALLY know, just how much she has helped me to grow as an artist, and just how many doors she opened for me, all just by being, Lori. Sweet, thoughtful Lori. I love you Lori! I know I am not the only person who you have inspired and encouraged. Thank you for being you, for your kind heart, your desire for everyone to be happy and to have faith in themselves. You rock. If you too have something to share to honor Lori, please feel free to join in the discussion in the Bead Soup Café on Facebook. I think it is important to let people know when they have made a positive impact on your life. It is a little way to bless them back, for all they have given. What a beautiful post Staci! You summed up so well what so many people feel - thank you for sharing! Oh wow. Wiping tears. It's been such a hard year, especially these last few weeks, and as I spent another day of watching the ceiling fan spin, I wondered if I was done, because I just couldn't see ever feeling well enough to finish all the things I want to do with my life. And you go and write this. I had no idea. Thank you. So very much. So beautiful. I really enjoyed your story. Thanks for sharing!!! The study conducted by leading management institute of India, IIFB of Arindam Bannorjee fame, who conducted the Timberland Outlet online specific study claims the figure to be 100% accurate like its claims of 100% placements. The study has inspired Facebook to claim the damages. The biz whizs of FB have started estimating the damages. Timberland Sale The IIFB study claims that the obsession with sunglasses began with the decline of Orkut and the advent of Facebook in India.